Norman has an awful speech impediment, he stutters constantly. He also cannot make direct eye contact with anyone, and chooses to look at their eyebrows or forehead instead. He is extremely proud of his Greek heritage, and likes things dark and quiet. It is odd to note that Norman had NEVER been promoted until arriving on the Odyssey even though he had been in Starfleet for over 25 years, but keep in mind that he was forgotten, and people even listed him as MIA on the Atlantis, thinking he was a casualty of the Dominion War. Norman is not funny, exciting, interesting, or worth talking too. *ACCESS DENIED* Psychological Data has been deleted by order of Starfleet Command. Hobbies: Astronomy, Astrophysics, Science, Math, Languages, and History. Likes: Astronomy, Astrophysics, Science, Math, Languages, and History. DisLikes: Anything not related to Astronomy, Astrophysics, Science, Math, Languages, and History. Norman Callius Boo'Gart, who goes by Norm for short, was born in 2332 in Athens, Greece. His parents, Morton and Demosina raised him to appreciate his Greek Culture and encouraged him to follow in the foot steps of the great Greek philosophers and scientists. Soon Norm found that he had an interest in astronomy, and interest that would consume the rest of his childhood. Throughout his years growing up he was glued to the family telescope, and because his parents were in Starfleet, and his father, and Admiral, he found himself moving from planet to planet and ship to ship which gave him endless new views of the universe around him. His father insisted that he become a student of the universe, and had Norman learn several languages while growing up, along with intense study in math and science. As a result Norm was often locked away in his room, happily studying or learning languages and history. His father was extremely proud to see his son fit the mold that he had created, and couldn't wait until Norm raised through the ranks as one of Starfleets great minds. His father enrolled him in Starfleet Academy, one year early at the age of 17. While in the academy Norman excelled in every single class, but for some reason had not been getting the recognition that he deserved. It was then that his father realized something was wrong... his son had absolutely zero social skills. Norman walked around the academy with ugly glasses, an awkward wardrobe and the most awful hygiene. His professors, while impressed with his work, went out of their way to avoid him, out of fear that the awkward young man might start talking... which was another awful realization to his father. Norman had spent his entire life at home, and met almost no other people in his life, except for his parents, as a result he was extremely shy, so shy in fact, that he was stutter uncontrollably when he talked to anyone. And even worse, he would never make direct eye contact with anyone either, instead he would look slightly above their eyes, more like their eyebrows, this caused many people to feel uncomfortable, and wonder if Norman was actually paying attention to them. The social disaster continued throughout the academy, Norman's professors were concerned about him and his shortcomings, so they ordered that he be observed to make sure that he was mentally stable. They concluded that he was well... just a little bit off. Sadly on the day of graduation, Norman graduated second in the class, to Jacob Shanti, one of the Fleet Admiral's sons who had been... made the valodictorian. That really upset Norm, who spent many days alone in his room reminding himself that he was the best up and coming scientist in Starfleet. But instead of confronting the academy on the matter, Norm just accepted it, like his instructors thought he would... however before Norm was assigned to the Proxima for his first Jacob Shanti was found dead in his apartment, his cause of death was a close range phaser on stun, when no further evidence or suspects were found, his death was ruled a suicide. Norman's first assignment was onboard the USS Proxima, a brand new Ambassador class starship. His first day onboard, he met the Chief Science Officer who assigned him to be the Astrophysics officer, after meeting the CSO, Norm headed down to the astrophysics lab where he immediately began to observe starcharts and study the vast field of Astrophysics. Sadly, no one on board even knew that Norm exsisited, he spent over 17 years on the Proxima, and had met only 3 people while onboard, the Chief Science Officer, and two students who came to study with him for only 3 months each. For the first 5 years onboard, people knew that some weird freaky guy worked in the Astrophysics lab, and people avoided him like the plague, he was so socially awkward that just saying hello to him was rumored to be an extremely difficult situation. But after the first 5 years were over, no one talked to Norm, not even his father who was convinced that he had now failed in creating one of the great minds of his time. For 12 years no one even knew that Norman Callius Boo'Gart exsisted. Until... The Proxima had been decommisioned in 2369, but no one ever told Norman, he continued working in the Astrophysics lab even after she was put into a scrapyard. And that was when one of the Zakdorn overseers discovered Norman doing research in 2370, an entire year after the ship had been abandoned. The Zakdorn immediately contacted Starfleet Medical, who took Norman in to be examined by a psychological team. For the next year of his life, Norman would be examined and studied to see if they could find out what was wrong with him, they were about to release a fascinating report to the medical community about the case, involving neglect, denial, and all sorts of strange personality disorders when Norm's father, Admiral Todd Boo'Gart stepped in and ordered the investigation closed, and the report trashed. Many think that the Admiral was so embarrassed about the thought of being responsible for his son’s condition, that in order to save his image, and let his wife die in peace, he intervened. As a part of the cover-up, Norman was given a new assignment, as an Astrophysics Officer, onboard the USS Atlantis, under the Command of Darryl Stripe. The Atlantis had incredible facilities for Norman, the Prometheus class starship was a vessel of deep space exploration in which he could finally conduct some real work. Socially, not much changed for Norm, the Chief Science Officer was the only man he had ever met onboard, and for 2 years he was an afterthought in everyones’ mind. But in 2373, the Dominion War befell the Federation, and turned the Atlantis from a ship of science into a ship of war. During the war, Norm continued to study and study and study... until the war finished. By then the entire crew of the Atlantis had seen so much battle and horrors (except Norm of course) that Starfleet had reassigned almost everyone back to earth, and gave the Atlantis a new crew in 2375, she was now under the Command of Captain William Jacobs. he crew might never had noticed that Norman existed until 2378 when the crew was under attack from a spatial anomaly that only an astrophysist could track. William Jacobs a was amazed to note that he had never even heard of Norman, he thought he had met everyone onboard... but then again apparently no one had heard of Norman. Everyone who had heard of him had left the Atlantis 3 years ago when she was being recrewed. 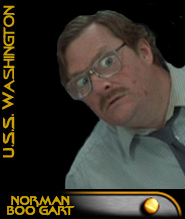 Norman was successful in tracking the anomaly, and out of pity... or because Captain Jacobs didn't want a creepy officer like Norman Boogart wandering around had him promoted and transferred to the USS Odyssey... The USS Odyssey as the Chief Medical Officer... a position which he had no experience... and where he would be forced to have human contact.